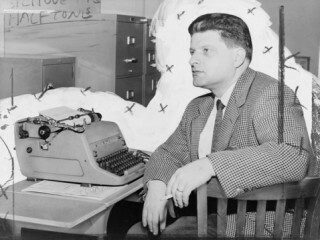 Paddy Chayefsky, also known as Sidney Aaron Chayefsky, Sidney Aaron born January 29, 1923 in Bronx, New York, United States - died August 1, 1981 in New York, New York, United States was an American writer and playwright. Source: International Dictionary of Theatre, Volume 2: Playwrights. St. James Press, 1993. The Broadway drama of the 1950's was dominated by Arthur Miller and Tennessee Williams, the one focussing on ordinary people and using their stories to make political and social comment, and the other writing about the very human psychological and spiritual pains of society's outcasts and freaks. Almost every other playwright of the period can be placed somewhere on a continuum between the two giants; and one way of defining the early work of Paddy Chayefsky is as giving the Williams treatment to Miller characters. That is, in his most successful early plays, for television and film as well as for theatre, Chayefsky dissects the ordinary lives of ordinary people and finds tiny but moving drama within. Among his theatrical plays, only Middle of the Night is as successful as his television play, Marty, in blending an accurate and intermittently satiric depiction of a milieu with the serious treatment given to the central story. The play is about a 53-year-old widower who falls in love with an unhappily married woman who is 30 years younger. She appreciates and returns his devotion, but friends and family on both sides are shocked by the mismatch, which seems to violate basic cultural taboos, and the lovers themselves are led to doubt their right to happiness. As in Marty, the very small question of whether these unremarkable people will stay together and have an ordinary chance of happiness is made a meaningful one through an unpatronizing respect for the reality of their emotions. The careful balance of social reportage, satire, and sentimentality begins to break down in Chayefsky's next play, The Tenth Man, as he moves from what had been his area of strength--the characterization of ordinary people--toward a more abstractly philosophical focus. The play is about a congregation of elderly Jews who decide that the schizophrenic grand-daughter of one of them is really possessed by a demon and decide to exorcise it. They actually affect the dead-spirited young man they dragged off the street to participate in the ceremony; with renewed faith and love, he proposes to the girl. But the human story of the damaged young people reaching toward each other is buried in vague discussions about the nature of sanity and faith, and theatrically overpowered by the string of easy and patronizing jokes at the expense of the bored and confused old men. That this movement away from small melodrama and toward philosophy mixed with social satire was deliberate is made obvious in the biblical play Gideon, which has almost no real human interaction, but rather builds to an interesting and challenging debate between Gideon and God about how man finds belief in an omnipotent deity too difficult and frightening because it leaves no place and dignity for humans. The ideas are not fully integrated into the play, coming almost as afterthoughts, and one must wade through too much easy humor built on the demythologized characterizations--God as a petulant old man, Gideon as a dim country hick--to get to them. Still, they are there, and give what would otherwise be a trivial play some weight. After two commercial failures--The Passion of Josef D., a misguided attempt to tell the story of Stalin through Brechtian devices which Chayefsky had not mastered, and The Latent Heterosexual, a satire on the dehumanizing power of success--Chayefsky left the theatre to concentrate on his parallel career as a screenwriter, where his best work resembled Gideon in placing thought-provoking ideas in otherwise unremarkable contexts. Except for those who know him only from such late filmscripts as The Hospital and Network, Paddy Chayefsky will probably be remembered primarily as the author of Marty, a 1953 television play later expanded into a film. The title character is a New York butcher in his 30's, overweight and socially awkward, who is stuck in an extended adolescence of living with his mother and idly hanging out with his buddies. He meets an equally plain schoolteacher at a dance, and they clumsily begin a small courtship--and that is just about it. The material is obviously very fragile, and Chayefsky's skill lies in making the small story seem meaningful while still acknowledging its comic aspects, and without lapsing into preciousness. Such films as The Bachelor Party, The Americanization of Emily and Network have in common the fact that they are all very conventional formula pieces into which Chayefsky was able to squeeze one or two scenes, discussions, or characterizing touches of unexpected depth. And that, indeed, might be the summation of Chayefsky's accomplishment on stage and screen: while less ambitious and talented writers settled for convention, and more ambitious writers stretched or challenged it, Paddy Chayefsky wrote little plays and films that were just a little deeper and better than one expected them to be. Born Sidney Chayefsky in the Bronx, New York, USA, 29 January 1923. Educated at DeWitt Clinton High School, Bronx, graduated 1939; City College, New York, BS in social science 1943. Served in the US Army, 1943-45: private; Purple Heart. Married Susan Sackler in 1949; one son. Worked for a printer, New York, 1946; writer in Hollywood, late 1940's; gag writer for Robert Q. Lewis, New York, 1950; President, Sudan Productions, 1956, Carnegie Productions, 1957, SPD Productions after 1959, Sidney Productions after 1967, and Simcha Productions after 1971, all New York; council member, Dramatists Guild, from 1962. Recipient: Screen Writers Guild Award, 1954, 1971; Oscar, for screenplay, 1955, 1971, 1976; New York Film Critics Award, 1956, 1971, 1976; British Academy Award, 1976. Died in New York, 1 August 1981. * Television Plays (includes The Bachelor Party; The Big Deal; Holiday Song; Marty; The Mother; and Printer's Measure). 1955. * No T.O. for Love, music by Jimmy Livingston (produced on services tour, 1945). * Middle of the Night (televised 1954; revised version, produced ANTA Theatre, New York, 1956). 1957. * The Tenth Man (produced Booth Theatre, New York, 1959). 1960. * Gideon (produced Plymouth Theatre, New York, 1961). 1962. * The Passion of Josef D. (produced Ethel Barrymore Theatre, New York, 1964). 1964. * The Latent Heterosexual (produced Dallas Theater Center, Dallas, Texas, 1968). 1967. * The True Glory (uncredited), with Garson Kanin, 1945; As Young as You Feel, with Lamar Trotti, 1951; Marty, 1955; The Bachelor Party, 1957 (published 1957); The Goddess, 1958 (published 1958); Middle of the Night, 1959; The Americanization of Emily, 1964; Paint Your Wagon, with Alan Jay Lerner, 1969; The Hospital, 1971; Network, 1975; Altered States, 1979. * Scripts for Danger and Manhunt series; Holiday Song, 1952 (published in Television Plays, 1955); The Reluctant Citizen, 1952; Printer's Measure, 1953, Marty, 1953, The Big Deal, 1953, and The Bachelor Party, 1953 (all published in Television Plays, 1955); The Sixth Year, 1953; Catch My Boy on Sunday, 1953; The Mother, 1954 (published in Television Plays, 1955); Middle of the Night, 1954; The Catered Affair, 1955; The Great American Hoax, 1957. * The Meanest Man in the World, Tommy, and Over 21 (all in Theater Guild of the Air series), 1951-52; scripts for Cavalcade of America.